Wow, what a week this has been! Thank you to everyone who has turned one dog walker’s lament into an internet sensation. The DINOS™ concept has taken off and in the past few days, I’ve had requests from all over the world to share the blog in newsletters, public spaces, and adoption packets. The message is spreading, folks. How cool, is that? And if that wasn’t exciting enough, I was thrilled to discover that Lili Chin, illustrator and mom to a DINOS named Boogie (just like my dog Boogie – what are the odds? ), created this fabulous illustrated version of our message! You can see the original post on her blog here. Many of you have contacted me to see if there are t-shirts and other merchandise available for purchase. I’ve teamed up with a graphic designer (she’ll be revealed soon), who shares her life with DINOS and has agreed to help me turn my slogans, both funny and serious, into gear for a DINOS Cafe Press store. In the not-so-distant future, you’ll be able to warn MDIFs in style! Finally, thank you to all of the dog trainers, dog clubs, rescues, and DINOS families that have shared the blog and joined us on Facebook. There is a movement building that is larger than anything I could have imagined and the potential to educate the public is here. So, keep an eye here on the blog and on the Facebook page for updates, plus resources and tips for Living with DINOS…We’re Taking Back Our Space! p.s. don’t forget to check out Lili’s work at Doggie Drawings! I am SO HAPPY to find out that you are a dog walker! 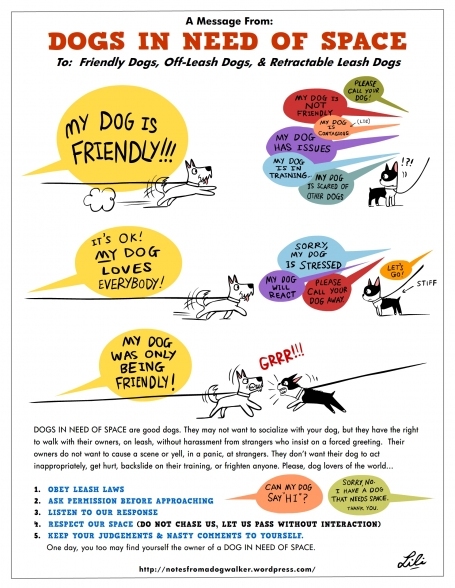 As a fellow pet business owner, I’m often quite dismayed at how few so-called professional dog walkers really realize the precautions necessary to keep clients safe while on walks. Huge bonus that you are a Pit Bull advocate as well. Keep up the great work! Love it! I run a non-profit working SAR and Police K9 group – The Working K9 Association of Central PA (WKACP) and with permission and credit to http://www.doggiedrawings.net we would like to get the word out by putting this on our demo tables. We do about 20 demos per year and we like to pass on messages like safety around dogs. Thanks for coining the DINOS concept and thanks to Lili for making it easy to get the message out. Hi Kris, You’re welcome and thanks for reading! We’d love for you to distribute at table events. Click on Actions> View All Sizes. will you make this a poster and/or tear off sheet and sell them?!! 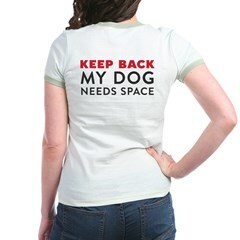 I would give out at dog parks, in classes, on trails, hang in vet’s offices, etc! Hi Kim, I just created pdfs of the blogs so they can be printed out! 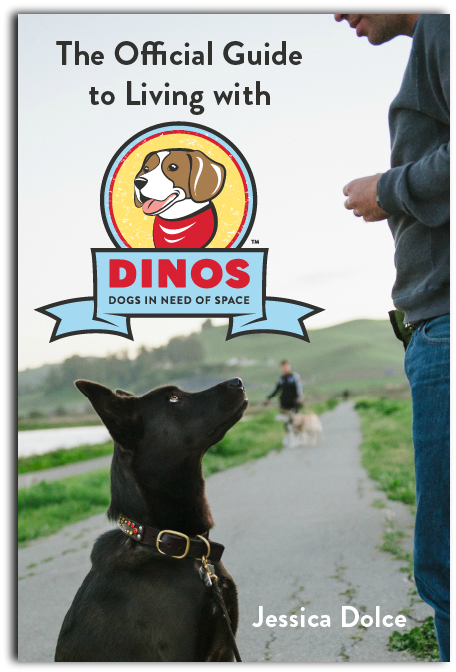 Here’s the link: https://notesfromadogwalker.com/2011/12/04/dinos-handouts-are-here/ Print away! My plan is to write a book in laymans terms with scenarios people will come across in everyday life, explaining to people why “its NOT ok, and he’s NOT just being friendly” in an effort to get people to better understand dogs and the situations we put them in. I just read your article today and LOVED it even if I don’t have a DINOS I hate MDIFs as they’re a nuisance when training a puppy and just about every other time, too. 😉 I’ve made a link to the article in my blog post for tomorrow, recommending people to print it out and give it to the MDIFs they encounter. LOL.. Now I come here and find out there’s even more stuff on the way. Love it! THANK YOU THANK YOU from a mom with 3 rescued golden retrievers one of which is a very serious DINOS. It has been quite a journey learning about my fearful and sometimes reactive little girl, but I know that she does best when given her personal space. 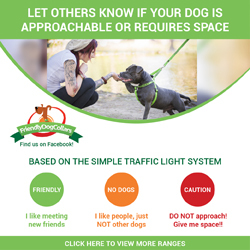 It’s so hard for me to say “my dog is not friendly” because she is such a sweet girl to me…but the reality is that she really doesn’t like to be approached by loose dogs, overly “friendly dogs” and children of the same! I cant WAIT for DINOS gear. I actually ordered a t-shirt for my girl that she can wear that has a hand print within a circle that has a line through it and it says “behavior training in progress” Please dont pet. I’m proud to be associated with other responsible parents of DINOS and I will be anxiously awaiting the DINOS merchandise on Cafe Press. I will also spread the word through my rescue organization (Golden Rescue of Southeastern Virginia). Thanks so, so much for your support! I too am tired of saying “my dog isn’t friendly”, when in reality, he’s a sweetheart that is just scared and needs a little space! I’ll let everyone know as soon as the store is up and running! I love this!! I walk our Aussie mix that is so over the top friendly that you can almost hear cartoon music playing as you watch him interact with the world…but I also walk his doggy brother who is the Ying to the Aussie’s Yang!! I would be SO happy if me or my DINOS Schnocker could wear/carry something to let the world know that our walk is for the 2 (or 3) of us to enjoy some outside time on our journey for good health. He’s cute, he’s a major cuddler, plays well with his family, friends, kids & cat/dog pet siblings…but on a walk or in his fenced yard, he’s a DINOS!! He has super social dog parents that hate coming across as rude to MDIFs after the initial 3 tries to request that we have our needed space & just keep walking! We cross the street, treats/praise for no barking, politely deny access…until we’re the ones that need to GRRRRRRRRR!